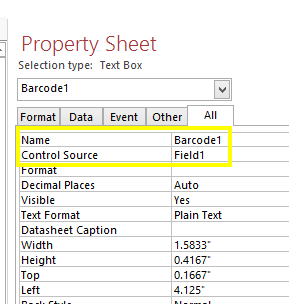 The tutorial describes how to generate Code 128 barcodes using the Native Generator for Access in Microsoft Access 2013. 1. Download the Native Generator for Access Linear or 2D version. 2. 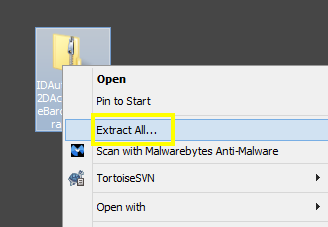 Right-click the product zip and choose Extract All. Follow the extraction process. 3. The tutorial uses the Linear/2D version of the Native Access Generator. Because we need to generate a Code 128 barcode, select the IDAutomation_AccessBarcodeGenerator folder. 4. IDAutomation includes a sample database that displays barcodes named IDAutomation Native Barcode for Access.mdb. 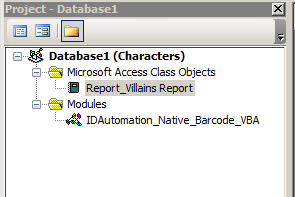 However, because the tutorial explains how to use the product in your own database, select the VBA modules folder. 5. 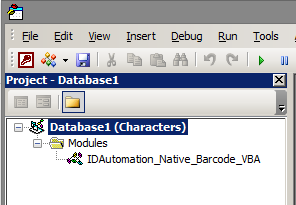 Note the location of the IDAutomation_Native_Barcode_VBA.bas file. We will import this fine into Microsoft Access using the Visual Basic Editor. 6. Open Access and select the Create tab. 8. In the Visual Basic editor, select File--Import File. 9. 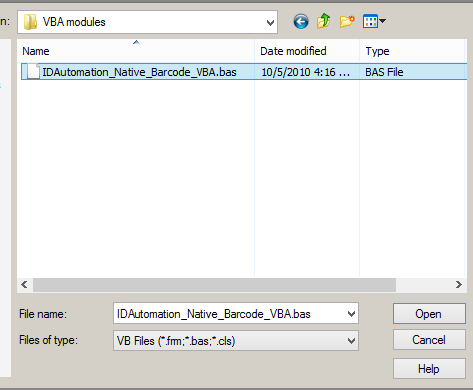 Navigate to the IDAutomation_Native_Barcode_VBA.bas file;location noted in step 5. 10. 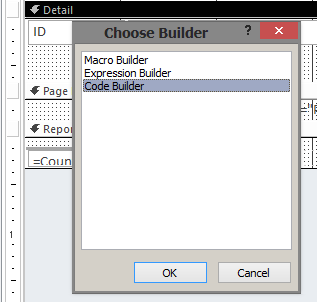 To view the VBA, select View--Project Explorer. 11. Select File and choose Close and Return to Microsoft Access. 12. Right-click the report and select Design View. 13. 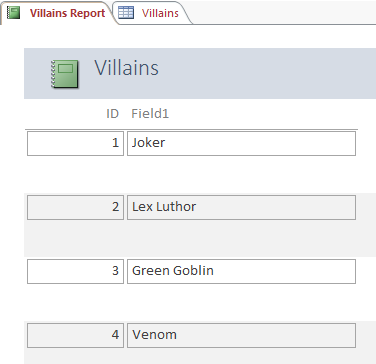 In Design view, the report should resemble this screen shot. 14. In the Design tab, select the Text Box with a left-click. 15. 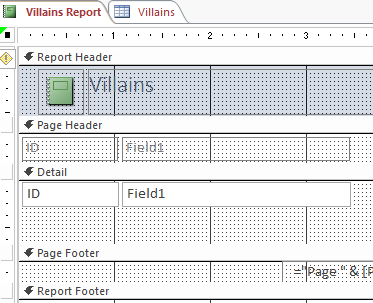 Navigate to the Details section of the report and left-click. 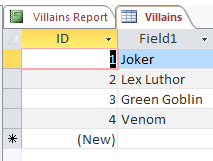 It will place the Text Box into the report. 16. Left-click the label and select the Delete key. Resize the Text Box to desired size. 17. Right-click on the text box and select Properties. 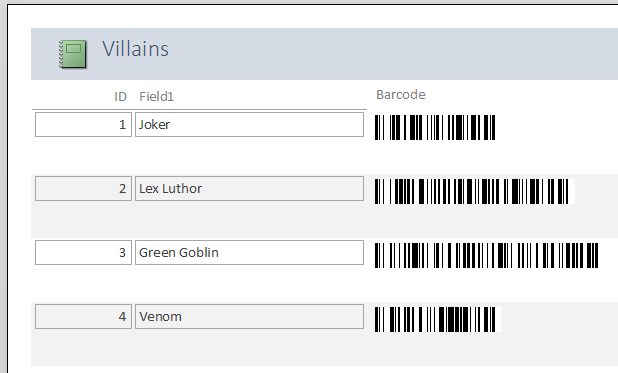 Change the Name of the text box to Barcode1 or desired name and verify the control source is the field that needs to be encoded in the barcode. 18. Save the report. 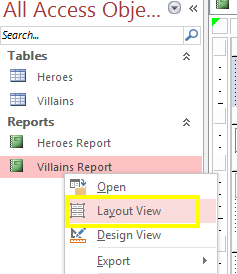 Right-click the report and select Layout View. 19. Return to Design Mode. 20. 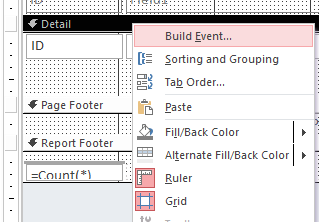 Right-click the Detail section of the report and choose Build Event. 21. Choose Code Builder and select OK.
22. This will open the Visual Basic editor Microsoft Access Class Objects folder. 23. 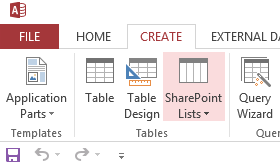 Select File and choose Close and Return to Microsoft Access. 24. 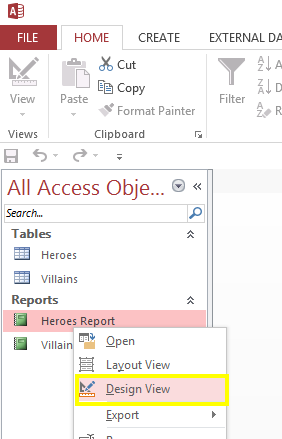 To run the report, double-click it. 25. Because the report is created in Access 2013, the barcode will not be visible during the Detail_Print display. To display the barcode run a Print Preview or Print the report directly to the printer.